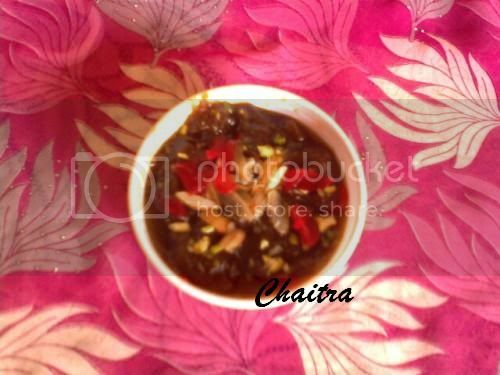 I am celebrating my blog's first Anniversary with this sinful dessert~Qubani ka meeta.Qubani ka meeta is a traditional Hyderabadi sweet made from dried apricots and Hyderabadi weddings remain incomplete without this sweet. Wash and soak apricots overnight in water.De seed them and put them in a sauce pan along with the water.Now add sugar to it.Cook for 20-30 mins or until the apricots become soft.Add chopped nuts.Mix all the contents well.Once you get the required consistency you can off the flame and transfer the contents into a serving bowl.Allow it to cool and then garnish it with nuts and serve it with ice cream or fresh cream.I suggest u to serve it with ice cream. That is all.So go ahead and try it.But do drop in with your comments. Note-Adjust the ingredients(sugar) as per your taste.